The requirement to pay for a landline is a non-starter for me. I haven’t had a landline for about 5 years, and have no intention to start having one. This is 2014, not 1974 – I’ll stick the CenturyLink DSL. FYI – I saw a truck installing boxes on the utility poles with loads of coiled up black wire on 26th on the east side of the Ballard Community Center. I am assuming it is for the Clink upgrade. I noticed that the poles along that street look like they are straining under the load of all the wire and attachments! There is some seriously thick black cable running down that street. FYI – Today there were trucks on 28th between 65th and 58th installing cable on the utility poles. Same trucks that were on 26th the other day. Hey All. Sorry I haven’t posted an update lately. As you can guess we’ve been extremely busy. As of today approximately 22K households and nearly 5K office buildings are qualifying for our Fiber Gig Service. As you can guess, a huge part of that is in Ballard. @chris – There is no requirement to have a land line. You get a better price if you bundle, but don’t have to. And, as always, if you are having any problems please let me know. Tandm, I know that you’re not making these decisions, but it is insane to require a customer to bundle a service that they will never use (landline) in order to receive a less expensive net price on the service that they do want. If there was a deal where I could reduce both of my costs for internet service (while increasing speed) and DirecTV (where I’ve been a customer for nearly a decade, and thus do not qualify for “intro” pricing), I would be interested. Not sure if you can kick that up to the people who make those decisions, but if you can, I would appreciate it. I’ve been extremely satisfied with both services, especially in light of the only other option out there, Comcast, which I will use only at the point of a gun. Perhaps there is an implied cost to my loyalty as a customer. Hi All, just checking in. I was just looking at the numbers Ballard is really getting blanketed with Fiber to the Premise. Also if you have the service and would like to chime in on how its working, I would love to hear it. As always, If you are having any problems, please let me know. Tandm – Thanks for getting us hooked up, working great so far and even saving a few dollars a month. The only extra costs for us were the new modem and instillation costs. I will say that I signed up on CenturyLink’s website to know as soon as I could sign up for fiber availability yet it never notified me… if it wasn’t for you I wouldn’t have known I could order it. Richy – I saw that too. I look at it as good news, the more the competition the better/faster it gets (hopefully) for the end users. We are now approaching speeds that make streaming 4k content much easier. 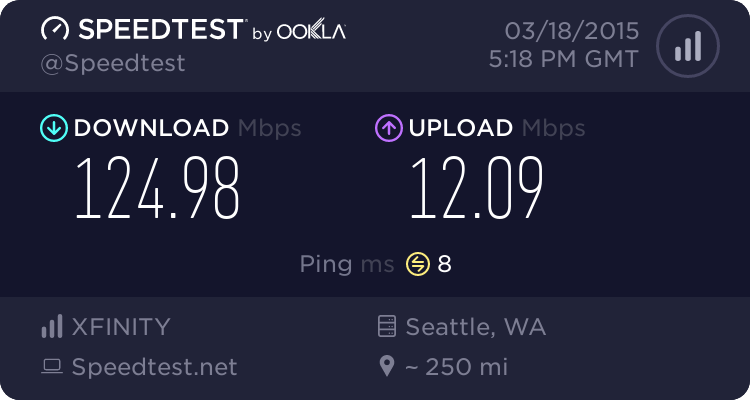 Last weekend I was down in California at a Starbucks using their WiFi when for kicks I decided to check what data speed I could get from the TMobile data connection on my tablet. At least at that spot in Los Altos, I got about 85 Mbps download / 35 Mbps upload! Wowsa! Of course, there’s a monthly 3 GB limit on that line, and here in Ballard I’m now blocked from the cell towers by a new 6-story building! So, if we’ve seen CenturyLink trucks installing big metal boxes, and lots of heavy cable on the poles over a period of many weeks on our block, does that mean we likely will have the Gigabit fiber option from Century Link? Totally curious! I don’t know Clamster, but when I saw them installing it on my street (which was painfully obvious I might add), I didn’t notice any latter effect of poor television reception with just an antenna. or maybe we’re the last two people in Ballard? I, too, would not have known about Fiber were it not for TandM posting here. I just got it, and I could not be more deliriously happy about it. 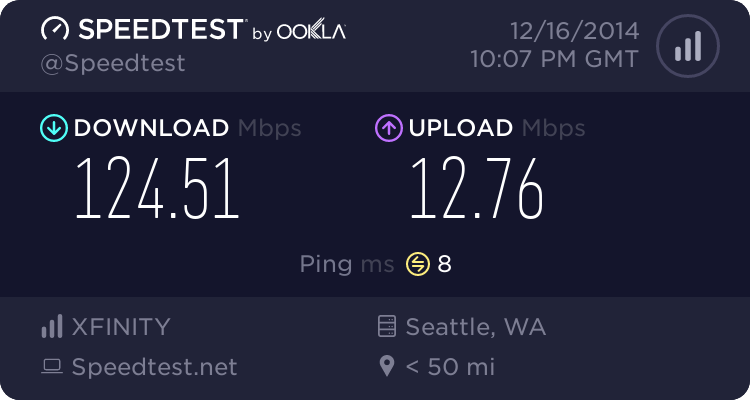 I went from a whopping slug-speed of 1.3 Mbps (our DSL which promised 6) to 40. One happy customer here. Well, April is here and still no fast service in my corner of Frelard. We had Clink come out and work on things since we were not getting even 1 mbps. They were helpful and we are back up to the 3-6 ballpark. Best we can expect from this address. We pay $95/month for this [crap] including home phone unlimited. And yeah, dealing with the phone tech support didn’t exactly inspire confidence. Tandm and/or others – I have some technical questions as I try to make some decisions about moving on up. As I understand it, the basic premise is that fiber comes directly into the house and goes into a modem, which is likely also a WiFi router. For lots of reasons, mainly that I don’t trust tech stuff that I am not in complete control of (yes, I am one of those people), I have no interest in a CenturyLink-provided WiFi router. To be fair, I also have the same viewpoint on Comcast-supplied hardware. I refuse to do business with Costco, so that is kind of a moot point. Anyway, after it enters the house, it has to get distributed somehow to all of my devices. In my case, it is exclusively wireless. All is relatively well to this point. Except that none of my devices is, based on my research, even remotely capable of getting close to that kind of throughput (MacAir, a couple of AppleTVs, PS3, iPhone and iPad, all roughly 2 years old). Since it is just me (the dog does not use the Internet, and would be offended by the number of cat pictures I’ve downloaded), I’m trying to figure out if this is worth it to me now, or whether I should just wait for a while and live with the 3.5 megs down that I get from CenturyLink (well below the 12 advertised, but that’s a separate subject). This is not intended to be a jab at CenturyLink. I’ve had their DSL service for 10+ years, in three different locations, and have had to call tech support twice. One of those was a particularly difficult Cisco modem configuration, which took the tech all of 10 minutes to solve.